WELLSTON, Ohio — Bouncing back to end the week on a high note. 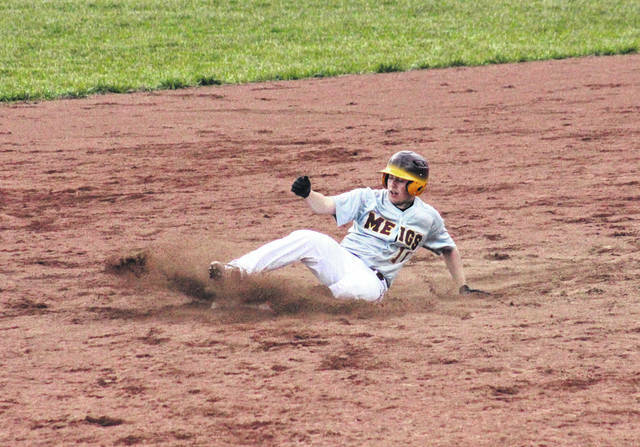 After dropping an 18-4 decision to Athens on Wednesday, the Meigs baseball team shook it off and picked up a 4-1 Tri-Valley Conference Ohio Division victory at Wellston on Friday. Meigs (3-2, 2-1 TVC Ohio) broke the scoreless tie and took the lead for good with two outs in the top of the first inning, as Matt Gilkey hit a one-run single, and Tyler Tillis followed with a two-run single. Wellston, which stranded a runner on base in each of the first three frames, ended the shut out with a run in the bottom of the fourth. The Marauders, however, got the run back in the top of the sixth, when Michael Kesterson scored on a wild pitch. The Golden Rockets brought the potential tying run to the plate in with one out in the bottom of the sixth, but wound up stranding two runners in scoring position. Meigs gave up a double to start the bottom of the seventh, but got the lead runner on a grounder, and then sealed the 4-1 win with back-to-back strikeouts. Briar Wolfe was the winning pitcher of record in a complete game for the Marauders, striking out six batters and walking three, while allowing one unearned run on five hits. Zane Ervin took the pitching loss in five innings of work for the hosts. Leading Meigs at the plate, Andrew Dodson was 2-for-3 with a run scored, while Gilkey was 2-for-3 with an RBI. Tillis singled once and drove in two runs, Kesterson and Cory Cox both singled once and scored once, while Wesley Smith contributed a single to the winning cause. Jeremiah Frisby led the Golden Rocket offense with two hits in four chances. Brock Eggers doubled once for the hosts, Hunter Cardwell singled once and scored once, while Chase Ingalls added a single of his own. Meigs committed the game’s lone error and stranded seven runners on base, one fewer than Wellston. The Maroon and Gold will look to make it a season sweep when these teams meet in Rocksprings on April 24. After visiting Alexander on Monday, Meigs is set to host Nelsonville-York on Wednesday.